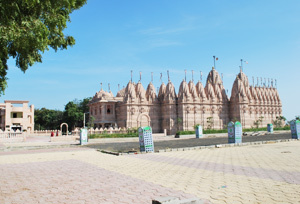 The Vasai Jain temple is located in the village of Bhadreshwar, which is in the district of Kutch in the state of Gujarat. This is the place where Bhadravati, an ancient city, once flourished. This city is mentioned in the Mahabharatas, the renowned mythological epic in India. This temple and the city date back to the 555 AD. The Vasai Jain temple at Bhadreshwar was an important and thriving center for Jainism in those days. It was a very popular pilgrimage site among the Jain devotees in the 12th and 13th centuries. In the 17th century it fell to the pillages of marauding invaders and nearly destroyed. This temple is considered to be the oldest of the Jain temples in the Indian subcontinent. Even though it had been destroyed many times over the centuries, by both human hands and natural disasters such as earthquakes, today it stands proudly rebuilt and restored to its former glory. The original foundation of the temple was laid centuries ago by a devout Jain named Devchandra. This was then renovated in the year 1125 by Jagdusha, who was a renowned and wealthy Jain merchant and philanthropist. During the many earthquakes that struck this region in the 17th and 18th centuries, this temple was renovated by the Mistris of Kutch. The most recent earthquake in 2001 resulted in total destruction of the temple. The temple has now undergone a complete restoration and rehabilitation. The Vasai Jain temple lies in a courtyard that is 48 feet in width. There is a row of 44 shrines around the temple. The temple faces east. The plan of the temple resembles that of the Dilwara Temples of Mount Abu in Rajasthan. The Vasai Jain shrine is home to three images on white marble. The central image is that of the second Thirthankara, Ajitnath, dated AD 1565. The other images are that of the 16th Thirthankara, Santinath, and of Parshwanath.